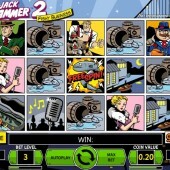 Jack Hammer 2 is the follow-up to the highly successful NetEnt slot title Jack Hammer. Based on the adventures of an old-school 1940s detective, Jack Hammer 2 takes the great features of the first game - gorgeous cartoon graphics and nice bonuses - and ramps everything up a notch. In this sequel Jack Hammer must take down an underworld crime syndicate that operates down the local harbour. 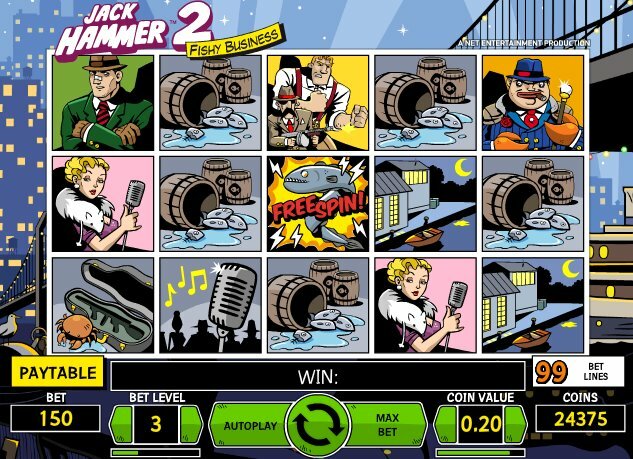 Jack Hammer 2 is a 5-reel slot with 99 paylines. There are also sticky wins, Wild symbols, multipliers and free spins. The sticky wins are something that will be a great draw for slots players. These will pop up whenever you hit a winning combination. The symbols that made up the combo will then hold in place whilst the other symbols re-spin. This will continue provided a new winning combination is created. When no new winning combinations are created, the sticky Wild symbols will no longer hold for the next spin. The Wild symbol will substitute for all other symbols except for the free spins scatter symbol to complete any winning combinations. The Wild can be key in securing some big wins during the regular gameplay. The Free Spins bonus round in Jack Hammer 2 is triggered when you hit five or more free spins scatter symbols across the reels. This is more than the usual 'three or more Scatter' symbols required to trigger the free spins in other slots, but then most other slots don't have sticky wins. You can win up to 20 free spins, depending on how many free spins scatter symbols you triggered the bonus round with. You will also receive a 2x multiplier attached to any wins during the bonus. Quite often a slot sequel doesn't quite live up to the hype of a successful predecessor. Fortunately, Jack Hammer 2 does match its expectations and this is a top slot with a lot to offer. The apocalyptic Zombies slot by NetEnt is another comic-book styled slot that fans of our chisel-jawed detective will enjoy.